This super tall display stands nearly 15 ft tall creating a commanding presence where ever it is displayed. 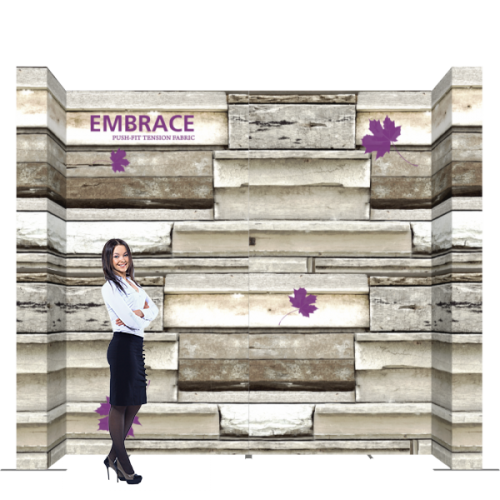 The Embrace™ 17 ft wide Quad Popup is u-shaped and comes with SEG push-fit printed fabric graphic. The frames are collapsible, lightweight and portable. Embrace displays offer easy tool-free set-up. The sleek lightweight anodized silver frame sets up quick and easy to support the super tall booth with minimal effort. This sturdy hardware comes with a lifetime warranty to back the quality. This is one display that will last a long time through many uses making a big impression on all who see it. This popup booth comes with dye-sub printed graphics with deep colors that pop. SEG push-fit systems fit snug and stay smooth right to the edges of the frame. This popup is certain to generate lots of attention for you and your business at all your events. How to Setup Your Pop-up. Setting up your popup is fairly simple, more in depth instructions will come with the kit. Lay the frame on the floor and stretch open to size, snap together the locking arms. Slide on the top and bottom channel bars, stand up the display frame and install the side channel bars. Press fit the graphics into the recessed groove in the frame, start in the middle then press in the remaining graphic moving out towards the corners. Repeat for the end caps or other sides. Install the stability feet into the dovetail clips if feet are required. That’s it, if setup is done correctly the graphic will fit snug and smooth and the popup booth should be straight and stable.